Mach II With My Hair on Fire! I have no clue where the time goes. I just can't believe that I have completed one full year of school and that I still have one full year to go, mostly. I'm trying hard to graduate by Dec of 09 instead of May of 2010, but it will all depend on what they offer for summer classes this coming summer session. I'm also trying to add a minor in history, but I'm not sure if that's going to happen or not. I have managed to maintain my 4.0, I just need to keep my head in the game for the next year or so. I did get good news that the Honors College is going to let me graduate with Crimson Scholar status, even though they just changed the rules that would have taken that away from me. Since I'm a transfer student and a bit of a rare case (isn't that the story of my life) they are going to make an exception for me. YAY! I get screwed out of $$ because of being a transfer student, but the powers that be have decided to cut me a break and not screw me out of the academic accolades. I've also put in my application for Lambda Alpha which is a National Honors Society for Anthropology (which is what I'm getting my BA in for those who don't know). 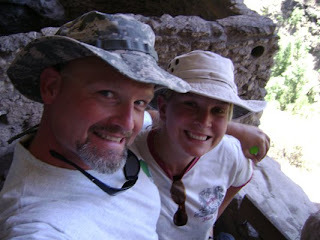 Ok, so I haven't posted pics on here in forever, so here are a couple from WAY back in June when Bill and I went to Silver City, the Gila Cliff Dwellings, and the Cat Walk. Silver City was a let down. I had heard so much about how cool Silver City is that I was really expecting it be a lot more than it was. 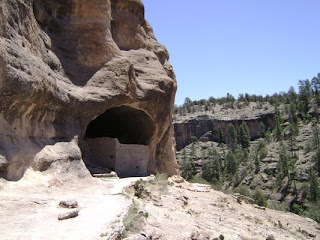 The Gila Cliff Dwellings were COOL and I would highly recommend a trip out to them. Also, at the end of the trail as you're coming back down from the dwellings there are two trees (see pic) one on each side of the trail. 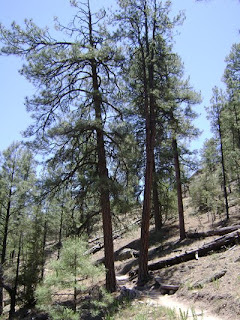 These are, I believe, lodgepole pine...or maybe pinon pine, I can't remember. Anyway, one was struck by lighting and the other wasn't. When you get your nose right up in the bark the one that was struck by lighting smells like vanilla, while the other still just smells like a pine tree. It's REALLY cool. We also did the Cat Walk and I thought I had pics from that but can't find them now, so too bad. Well, that's about all I have for now...I'm sure it will be another 6 months to a year before I get a chance to blog again. Stay tuned.